“Out with the new, and in with the old” – that’s how the saying goes, right? Well, at least that’s what Volkswagen thought when they decided to update the Bentley Arnage. 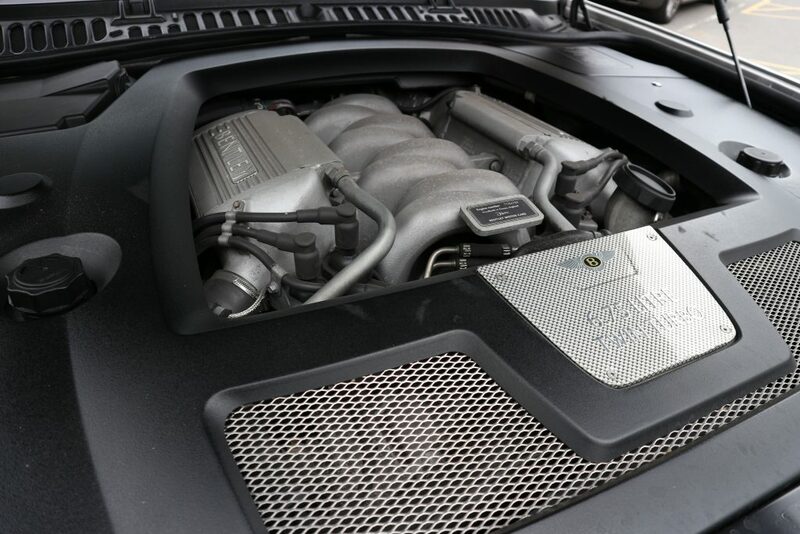 When the car was originally conceived back in 1998 it was powered by the twin-turbocharged BMW 4.4-litre V8, a brave move away from the old 6.75 single turbo V8 that had been in Bentleys since man discovered fire. Despite the BMW unit being smaller, it was also a lot more efficient and gave a pretty good performance. It was a 32-valve engine instead of the 16-valve Bentley heart and it produced about 350bhp, meaning it was no slouch. Nevertheless, when VW acquired Bentley BMW threatened to withhold the engines so VW went about setting up the older six and three quarter litre units but it wasn’t the match made in heaven a lot of purists hoped for. The new body was specifically designed for the lighter and smaller BMW lumps and they also had a smooth new 5-speed ZF gearbox whereas the old Bentley engine was coupled to an old, slow 4-speed box and the results were quite frankly terrible. Horrendous fuel consumption and a wallowy, dreary drive. After a few years, VW and Bentley set about curing the car’s ailment with some light TLC. In 2002 2 new Arnage models were launched, the Arnage R and the Arnage T. Both came with an upgraded version of the 6.75-litre engine and some much-needed handling and steering upgrades. There was also some cosmetic adjustments, both inside and out, but the biggest improvement was the addition of a second turbocharger. Out of the 2 cars, the T was the more powerful with 450-bhp and a tarmac-shredding 645 lb-ft of torque, and that’s the one I finally got to drive! As a borderline-obsessed “petrolhead”, I’ve been lusting over many cars for many years, some of which I’ve been lucky enough to drive and even own, but the one that tops them all has always been the Bentley Arnage. I’m not even sure why – I just love the combination of it’s vast and imposing stature and it’s leather and wood-clad interior and the way that it is so quintessentially British it may as well have a monocle over one headlight and play “God Save the Queen” when you press the horn. Despite being such a fan of the car, I have never been handed the keys to one. 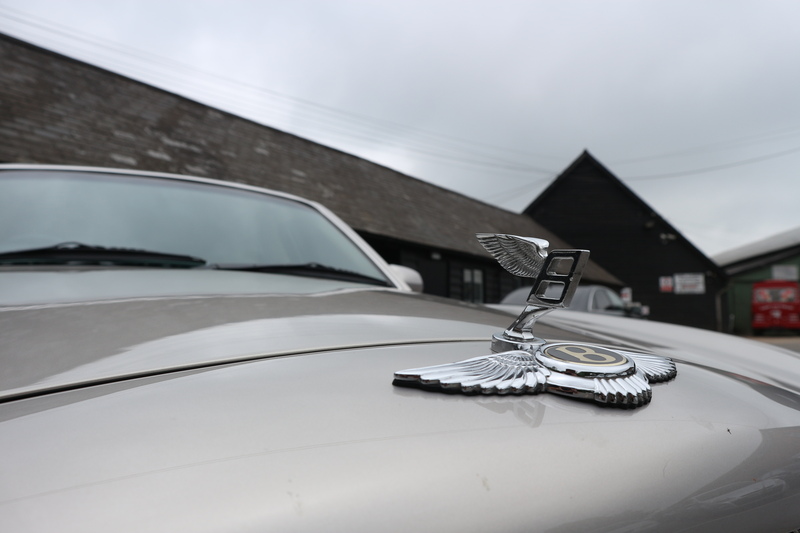 I’ve driven several Continentals, Flying Spurs and Bentaygas, but never the Arnage… until now. As luxurious and opulent as it was, I couldn’t help but notice how the now 15-year-old motor felt compared to its smaller sibling of exactly the same age, the then brand new Continental GT – they couldn’t be further apart with regards to “fit and finish”, but here’s a little secret, I actually prefer it. I’m a very traditional man and a strong believer in the “if it ain’t broke, don’t fix it” mentality and I can only assume VW were the same when it came to the interior. All the buttons and knobs are knurled aluminium and the was very little in modern conveniences. It did come with a pop-up Alpine navigation unit as standard but given the huge leaps in technology since then, you’d be better off with an AA Road Atlas in the boot. 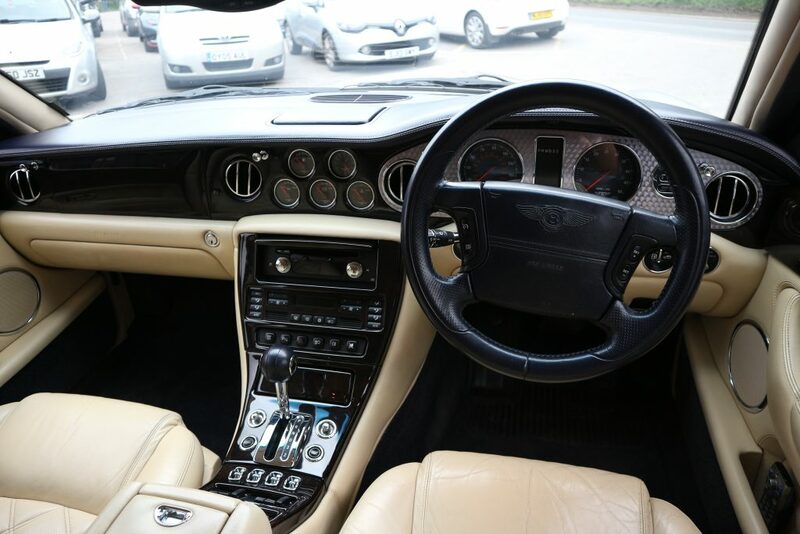 Sitting in the driver’s seat of the Arnage is like sitting in your favourite armchair, the leather is soft and supple and you’re surrounded by rich, handmade wood veneer and shiny aluminium and then you have the signature 5 dials in the centre of the dashboard. 2 small additions to this generation of Bentley are located by the gear selector in the form of a push-button starter and a Sport button. When pressing the starter button, the heart of the Arnage starts beating with a deep and bass-filled tone. At first, driving the Bentley is not dissimilar to any other large luxury saloon, I’ve driven and owned S-classes, A8s and such over the years and they all feel a bit like steering a narrowboat through a car park. 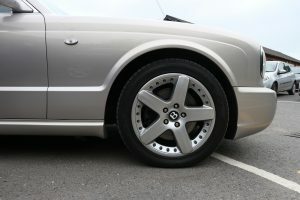 the Arnage is over 5 and a half metres long and nearly 2 metres wide and the body rolls slightly as you turn the wheel and navigate your way to the main road. Once you’re out, the whole dynamic of the car changes, it’s a lot like a forward in a rugby team. When they’re in their suits before the match they look like any other gentleman in the street, but it’s when they’re let loose on the pitch you realise the sheer strength and power they have, and the Arnage is just like this, it’s the James Haskell of luxury saloons. Like a Holland & Holland shotgun, you pull the trigger and it just shoots off. 0-62-mph takes 5.5 seconds, which isn’t that fast by today’s standards, but the car weighs 2.5-tonnes. You just don’t expect it to surge ahead in the way it does. 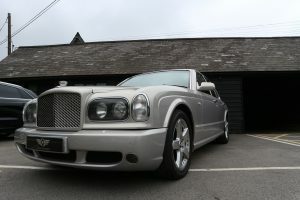 I had a good mix of B-road and motorway driving in the Arnage and it surpassed my expectations. Around the small villages through tight twisty roads the steering is light and although there is some body roll, there is nowhere near as much as I was expecting. It is, however, on the motorways where the Arnage comes into its own. A quick dab of the throttle as you enter the slip road and within moments you’re at the speed limit and the sheer amount of torque in that mid-range means overtaking is a quick and effortless task. Every time you put more pressure on that right pedal you can hear the thousands of litres of air being sucked in through that iconic mesh grill and the deep below of that V8 rumbles at just the right volume – not too loud as to be anti-social or tacky, but also not as silent as the cars distant relative, the Rolls Royce Silver Seraph. 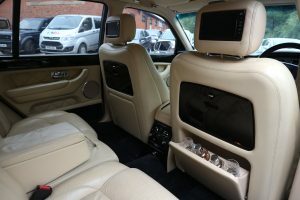 This Arnage may have a cocktail cabinet and DVD screens in the rear, but this is most definitely a car for those who love the thrill of driving. I have often got behind the wheel of a car from my childhood and ended up feeling a bit deflated, which I guess is a direct result of driving so many amazing new cars, but the Bentley was everything I expected and more to experience. It may not be groundbreaking in terms of technology and mod-cons, but it is everything one would expect a Bentley to be. There is a real sense of occasion when you get in, whether that be in the driver’s seat or the rear. I could imagine myself being chauffeured to a fine restaurant for dinner as much as I could see myself grabbing the keys and my gloves for a good old-fashioned Sunday morning blast. To have that combination of such luxury and comfort with all the power and grunt is rare to find in cars and these will always be the benchmark for high-powered luxury saloons. Cars like the Mercedes S55 AMG and Audi S8 from the same era were fantastic cars, but they don’t even come close to this. Obviously, all this comes at a cost, if you even brush your hand over the Sport button the petrol needle drops down and due to the level of over-engineering in the interior and under the bonnet servicing and parts are not cheap, but that’s part of the reason they are so special. They’re not a car you see every day and nor are they a car you would necessarily drive every day, but on the days you do drive it you will love every minute of it. 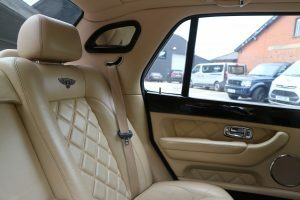 This particular Bentley Arnage T is for sale at Oakleaf Automotive and the full ad, along with the rest of their stock can be found HERE – I’d also like to thank Oakleaf for letting me drive this car after so many years of wanting to!